Love it. I have been posting it on FB for about 2 weeks now. Pic=1,000 words about where McCrory stands. Good show. Keep it up! These clowns think it's all a big joke. But the joke is on us. 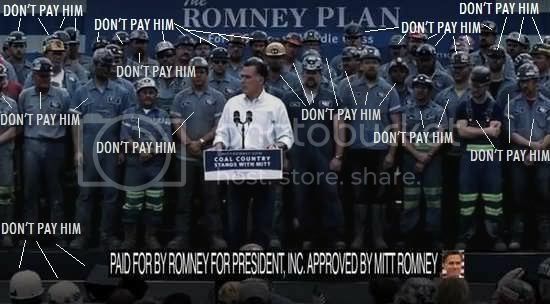 Romney is running an ad featuring the miners standing beside him who weren't paying federal income tax on the money they weren't earning because their employer forced them to be there off the clock.